Rounded Corner Business Cards is rated 3.7 out of 5 by 35. Rated 3 out of 5 by Larry from Very nice I thought that the premium stock would have been a heavier weight. These are very thin. Rounded corner business card printing is a 48HourPrint.com favorite. Little things make all the difference, and this is even more true with rounded corner cards. 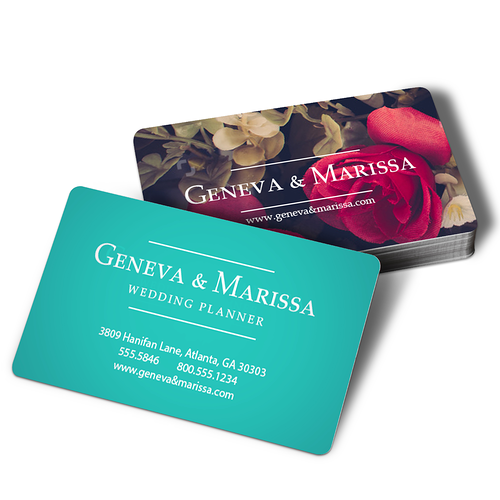 Rounded corners give a subtle, detailed look perfect for professionals who are looking to show off their creative side. If you need to showcase your creativity in a low-key way, rounded corner business card printing may be just what you need. These unique business cards are versatile as well. Post yours on public bulletin boards as mini advertisements for you and your business. Include them in business-related mail you send out. If your business ships items, tuck a business card inside the box before sending. And go a step further and invest in matching letterhead and envelopes for your official business correspondence. Design and print rounded business cards today.